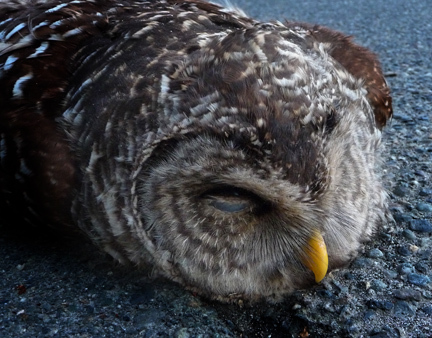 I saw an owl lying in the street. curiosity at how it got there. The intriguing aspect of this travel experience is that it occurred a few days ago on a short trip – a very short trip – a walk just a few blocks from my home. My wife had seen the majestic bird while walking our dog earlier that day and she told me about it. So I went back to that spot prepared to see an oddity – we don’t witness many owls in our neighborhood. I left, however, having experienced something more. On the surface, it appeared to be merely a well-preserved if exotic form of road-kill. But that demeans both the stateliness of its appearance and its impact on me. When I got home, both my wife and I surprised ourselves by sharing, almost sheepishly, that the owl caused both of us to feel a profound sadness. I wasn’t sure why our feelings about a dead bird would be so strong. This morning, my wife informed me that the parents of one of our son’s friends are getting divorced. As she said the words, I felt exactly as I did a few days earlier when I witnessed the dead owl. And in a moment as crystal clear as it was incomplete, I understood why. In both cases, I realized I am mourning the loss of something beautiful and magnificent. I must confess that in the hectic pace of each day’s to-do list, I could easily have heard the news of a couple’s marriage collapsing and felt badly for them. I could have acknowledged it but let it go, chalking it up as just another casualty of marriage in our culture. The owl, however, in a mystery I’ll probably never fully fathom, softened me and broke me open. Thus, when I heard of the divorce, I reacted not just with shock, but with intense sorrow. I mourn at the passing of something once so beautiful and now lost. I assign no blame: I neither know the circumstances enough nor do I have the right. I simply grieve for a couple that is no longer a couple. Not sure why Steve, but this one nearly did me in today. I hate to say I’m glad, but it’s nice to know it had a similar effect on someone else as well. I still can’t explain fully why the combined experience was so emotionally devastating other than to believe that God sometimes uses things like a dead bird in a gutter to get us to not only take notice, but to actually feel something deeply. Too often I will hear of friends or acquaintances getting divorced and I think, “That’s too bad.” And then I’m on to the next subject. Because of the associations and feelings this time, I’m wrecked by this news and cannot stop thinking about and praying for the couple. And maybe that’s the whole point. Thanks so much for sharing, Tracy. I once hit a beautiful male pheasant…stopped the car…went back and looked at him. The exquisite colors and form were intact….I turned him over and the warm body was utterly lifeless and limp. Sadness sucker-punched me. Another time a bunch of us forester outdoor-types were driving near the woods in winter fog. A large barn owl flew out and smacked the windshield. We stopped, hopped out of the vehicle, and quickly tumbled down the ditch to inspect the bird. Dead. The driver cursed showing both anger and sadness. The vulnerability, the magic of flight, and the beauty of birds …makes us want to possess them…to hold them…like a child would. When confronted with that opportunity through road-kill, we are sad and guilty. Guilty, for belonging to a community that is their destruction. It is part of our life here…to cope…to be kind…to appreciate what God has created. What a beautiful way to put that, Ken. We are indeed sad and guilty when we have these kinds of experiences but unless we do have them and come face to face with these wonderful creatures, we rarely acknowledge your point that we belong “to a community that is their destruction.” Thanks for sharing this because it adds yet another dimension to this whole experience with the owl. Great thoughts! Thanks Steve. Mourning the loss of what is beautiful is as it should be. We build callouses for reasons of survival and selfishness but it’s always life giving to experience the sorrow that “death” produces. Gives value and dignity to our lives. Well written. Isn’t it amazing how easily we build those callouses? And the funny thing about this is that it is only in the sorry and mourning that you realize how beautiful the thing actually was. Thanks for the good reminder, Mike. Nicely done. These things in the world are not observed and talked about often enough. Thank you.